This month is Diabetes Awareness Month. There's a lot going on. The Big Blue Test. The World Diabetes Day Postcard Exchange. Blue Fridays. And a photo challenge I will actually complete (hopefully). 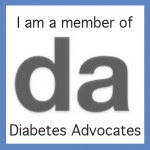 Kerri created a Diabetes Month Photo-a-day challenge, and so far I've managed to keep up. See all the prompts here. Day 1: Past. The past 24 hours. Day 2: Check. Checking my insulin on board before taking a correction bolus. Day 3: Snack. No snack for me. Except maybe veggies or cheese. numbers, but the progress they show. opportunities to advocate. People ask about it. Day 6: Relationship. My husband is my rock. His support makes every day better. Day 7: Blue. My favorite Blue Fridays accessory: my blue circle necklace from CCARIA. I love these Photo-a-day prompts, although it's hard for me NOT to write paragraphs about each one (just don't have the time!) I am saving up some of the thoughts that they provoke for blog posts later. LOVE that necklace!!! That is a beautiful picture of that necklace!